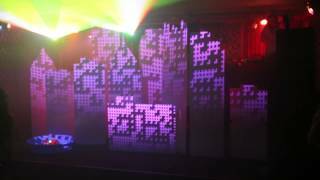 It’s been a while since I have been able to post some of my projection mapping adventures, but this one with Lazercrunk was fun and simple enough to share with anyone looking to get started. 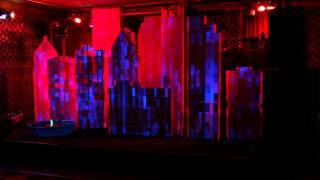 You don’t have to be local to appreciate an 8′ tall projection mapped city skyline. 10 buildings, spanning 16′ wide by 8′ high across the stage. Here’s an example of what it looked like by itself. 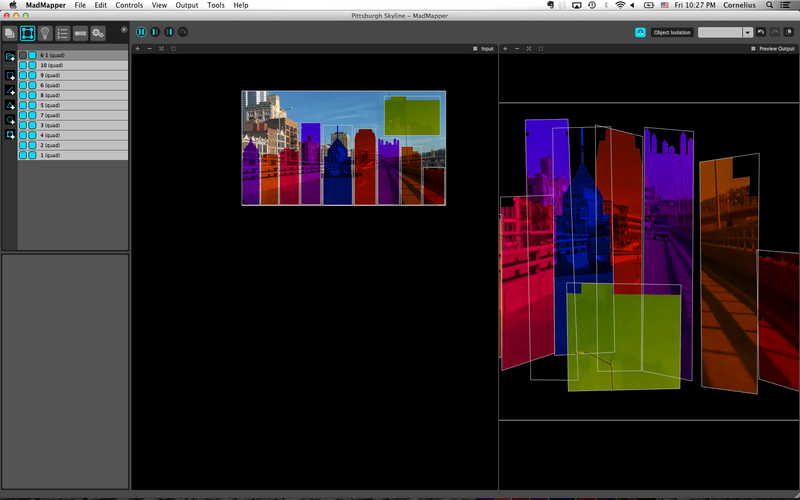 So for all of you who are interested in Projection Mapping, I’m detailing a little bit of my workflow in this post. While this design looks more complex than some of the ones I have done over the years, it is actually easier with proper planning and forethought. Essentially you start with an idea. In this case, Todd Keebs wanted to do a Pittsburgh Skyline to celebrate Lazercrunks 7 Year Anniversary. In order to cut the shapes out of foam core and have a design to share with me for content creation he used a vector and took it into his favorite program (Illustrator or Photoshop to give me templates for each building. 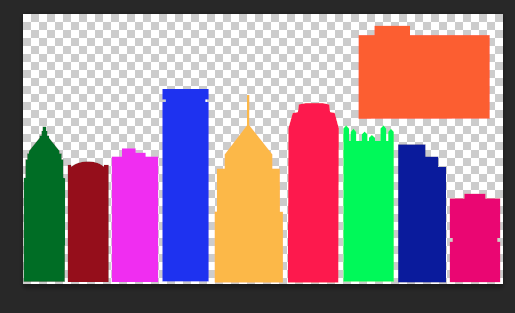 Make a cut out a Vector cutout for each building and separate them by layers. From here I can control each layer and customize my content as I see fit. The key here is to use the template for all of the content creation. Once you have chosen your template do not start moving the building vectors otherwise you will have to keep readjusting your setup within the mapping software. Todd and I have been working together for quite some time and we have learned a lot from one another. For this next part, I went to making custom content, and Todd started on the cutting. For most projects we use 4’x8′ sheets of foamcore, it’s lightweight, inexpensive, and easy to cut. Todd simply took the largest building in the set and set its dimensions to 8′ tall, in doing so with simple CAD software (or even illustrator) you can get the exact cut dimensions for each building just by using the internal rulers and measurements. 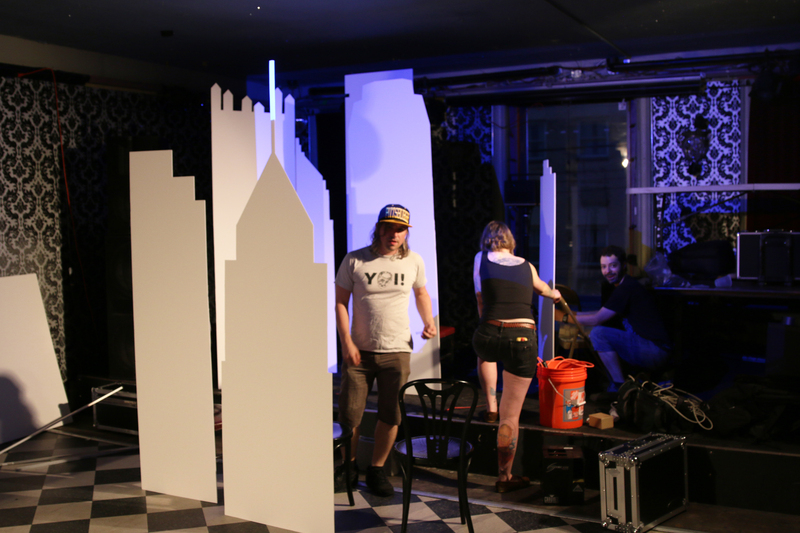 Each building was then cut to scale and stacked in a safe place before the show. The projector was turned on to show the full output and the buildings were squeezed into place. And using chairs as supports we simply attached each sheet with zipties and cable mounts. As you can see this is an example of a simple single projector setup. To eliminate shadows cast from the single projector source at this point you could add another projector and add a whole new element to your illusion, but for time sake I made the decision to hold off on this addition. (I’ll get into the pros & cons of using multiple projectors some other time). Using VDMX (my VJ application), I sent a signal to Madmapper via Syphon containing a still frame of my template. Once this is in the pipeline we simply make a rectangular selection for each building on the left (template / source window) and stretch it to fit onto the buildings on the right (output to projector). Leave comments and questions and I will do my best to answer them for you. Tutorial: Basic Projection Mapping for Outdoor Advertising.